The incident is related in Etienne-Jean Delécluze's memoirs of David. There is no exact date given but Delécluze places it after Napoleon's coronation, so in the early 1800s. The waxworks in Paris still used the name of Curtius at this time. "With these words, he led David and Etienne (Delécluze) to a recess where a sort of chest had been set up and he opened the lid. Lengthwise in the chest, hung on an iron triangle, were the moulded waxen heads of Hébert, Robespierre and several other men executed in the same period. "Here you can see", began the boy reciting his banal lines of explanation, "the head of Hébert, known as the Pere Duchesne, whose crimes led him to the scafford. 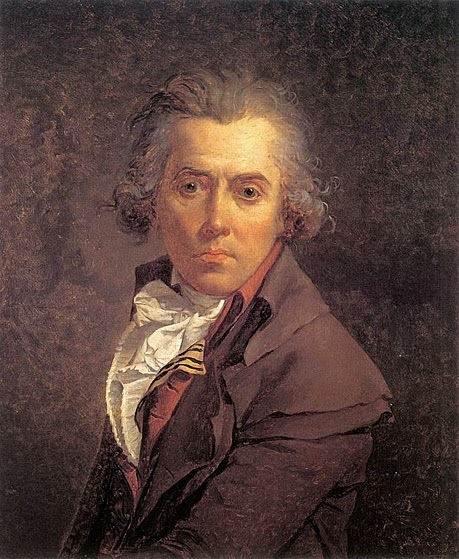 This other is the head of Robespierre; notice, gentlemen, that it is still wrapped in the bandage which held his jaw, shattered by a pistol shot, fired at him when....."
David and Delécluze never spoke of the incident again and Delécluze never recounted it during the painter's lifetime for fear of other people's sarcasm, but he remained impressed by his master's calm dignity in the face of this horrible sight.